In this beer blog, we are going to take a look at one of my one of my favorite brewery that is not in the Chicago market. 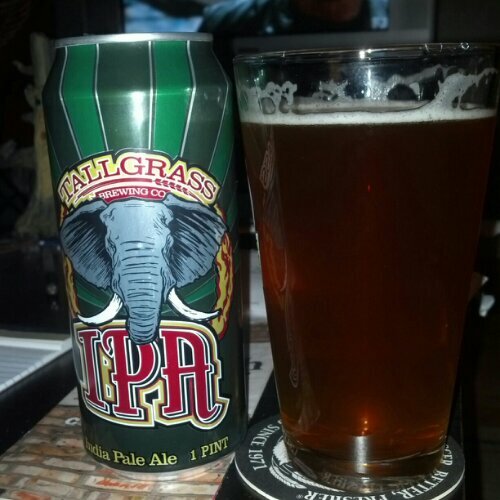 The beer is Tallgrass India Pale Ale. If you read my earlier blog post on their 8-Bit Pale Ale, you know about this brewery. If you did not, please, read that beer post on their flagship beer. Let us get into this beer. The color is light cooper with a hint of amber with a semi white head on the beer. The smell is earthly. The taste is earthy with a dry piney aftertaste. It is pretty drinkable beer. Bombastically Hopped. Surprisingly Malty. Pour a Pint…..
Our third beer, Tallgrass IPA, is an India Pale Ale that is rich, complex, and flavorful. We are proud to be the first brewery here in the Great Plains to have the first brewed, cans, and draft IPA out on the market! Tallgrass IPA originally came to life as a creation during Jeff’s early homebrewing days (batch Numero Uno), and it was consumed in short order by his friends who came over to cook out and help with the next batch. After some modifications over the years (because nobody’s rookie homebrew batch tastes all that great, but your friends will tell you it does) the recipe was dialed in to become what is now Tallgrass IPA. We love this beer and think you will too! What is with the name “India Pale Ale”? Well, India Pale Ales have a history that reaches way back to the days of the British Empire and the need for good and proper British beer for the soldiers in India. It just so happens that hops not only taste and smell great, they also have natural preservative properties that help keep beer fresher. Obviously, there was no way to keep beer cool on the long voyage around Cape Horn from England to India, so the intellectual forebearers of modern microbiology (genius brewers of course!) figured that if some hops were good for storage then heaps of hops would be great! With this technique, these hero brewers and their hops kept the beer good and the soldiers of the empire inebriated, even in the furthest corners of the globe. Even more, the hoppiness of the IPA preserved not only the beer itself, but the great taste it created has preserved the style as one of the most popular beer styles in the world in the 21st century. If those brewers weren’t knighted by the empire back then, they should have been!